There’s a lot of talk out there about how office design can motivate employees and improve their productivity. As a result, companies are investing more and more in creating interesting, custom-branded spaces. However, even if your office has been professionally decorated, you may not be getting the most out of your space when it comes to employee comfort and workflow. Technology continues to increase mobility and flexibility in the way we work. Our offices should be designed accordingly. By creating a flexible, fluid space that support our mobile workdays, you can better utilize each square foot in your office while actively facilitating employee productivity and well-being. In this post, we’ll breakdown why flexible workspaces matter and how you can create one in your office. 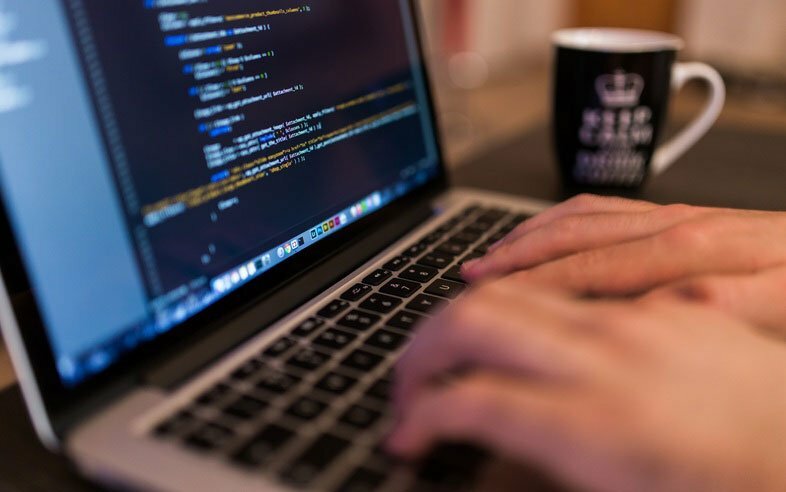 Since the constant virtual connectivity provided by laptops, tablets, and mobile devices has diminished the need for face-to-face interactions at work, research and data around how in-person interactions benefit us at work are mounting. Moreover, their data suggests that creating chance encounters and unplanned interactions, a design concept Steve Jobs pioneered at Pixar, improves performance. By instituting unassigned desks and communal work areas, employees are more likely to move throughout the day, which facilitates interaction and collaboration between employees who might have minimal interaction otherwise. Flexible design also has an important impact on an individual’s independent workday as well. Herman Miller’s study on comfort in the workplace found that “worker comfort directly affects important predictors of operational efficiency, such as productivity, job satisfaction, retention, well-being, and at its most basic level, of course, worker health.” Creating flexible spaces that allow employees to be mobile, switch up their surroundings, and have a say in where and how they work most comfortably can yield positive results in areas of employee engagement and job satisfaction. If your company is growing or has a lot of part-time or mobile workers, adopting alternative work policies like hoteling, hot-desking, or unassigned workstations, in addition to incorporating communal areas and multi-use furniture, can maximize your spacial efficiency and cut costs. 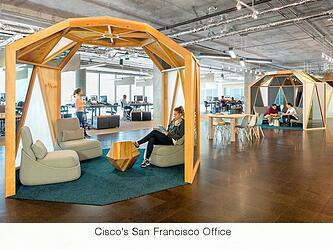 As a result, their redesign took aim at using space more efficiently by combining an evolved open-plan and unassigned seating to foster the mentality that each worker’s ‘office’ is the entire environment, not just an individual office or cube”, as Cisco’s Mark Golan put it in Herman Miller’s alternative workspace study. In the same report, Herman Miller noted that Cisco saved 37 percent on real estate rent by accommodating more people in the same amount of space. 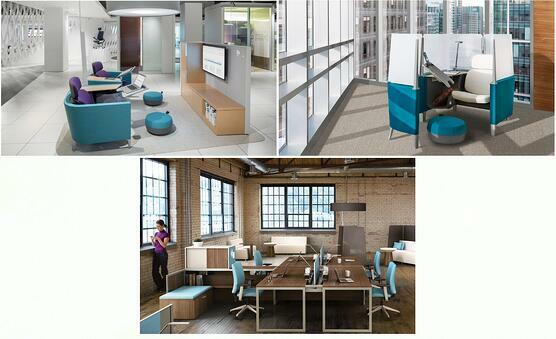 In practice, a flexible workspace replaces rigid cubicles with transformative spaces. You need designs that offer easy flexibility to cater to daily movement, various workflows, and collaboration. Collaborative workspaces. In an office, everyone wants their own personal space for heads down projects, but they also want to be able to collaborate with their colleagues conveniently and comfortably. 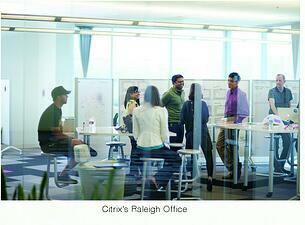 The software company Citrix System's office has most of its furniture on wheels-- even the whiteboards. That way, employees can move everything around to create collaboration spaces as needed. The furniture supplier Turnstone designed the Bivi Table with an attachable half round table to allow workers to invite friends, spread out projects, and hold impromptu meetings and brainstorms. Going beyond the cubicle. Cubicles have their merits when it comes to focus, but many companies are choosing to create more open floor plans and are picking cubicles that are moveable and have lower walls. Steelcase recently designed “Brody”, a new line of office furniture that harmonizes elements of collaboration, comfort, and focus. Flexible, multi-use space. 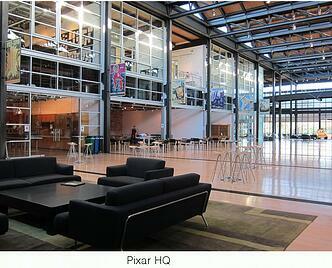 Not all offices have 12,000 square feet of raw space. Take advantage of what you’ve got. Your kitchen space can function as a large meeting room if necessary, as long as you have the furniture and the flexibility. Take Red Bull’s new New York City office for example; the company designed multiple spaces that can be repurposed at anytime at little to no cost, making it easy for the company to grow and change their needs within the same space. Flexible workspaces have a range of benefits, including increases in employee comfort, well-being, and productivity, which ultimately result in better business. To learn more about the future of office design, check out Gensler’s 2015 design forecast. And if you’re looking for an artwork solution as flexible as your future office design, get in touch with us here!